First of all, let me just say I get it. I get that Cloverfield is meant to be a modern day analogue of Godzilla. I get that postwar Japanese moviegoers witnessed an enraged giant lizard borne of nuclear technology stomp Tokyo flat in an unstoppable pique, and I get that Godzilla became a classic for that very reason. I get that we Westerners were long due to be attacked on film by own very own allegorical creature as pop therapy for our terrorism anxieties. Perhaps we need that movie some time. But significantly more advanced than Godzilla in terms of visual style and special effects, I don’t think Cloverfield is that movie. 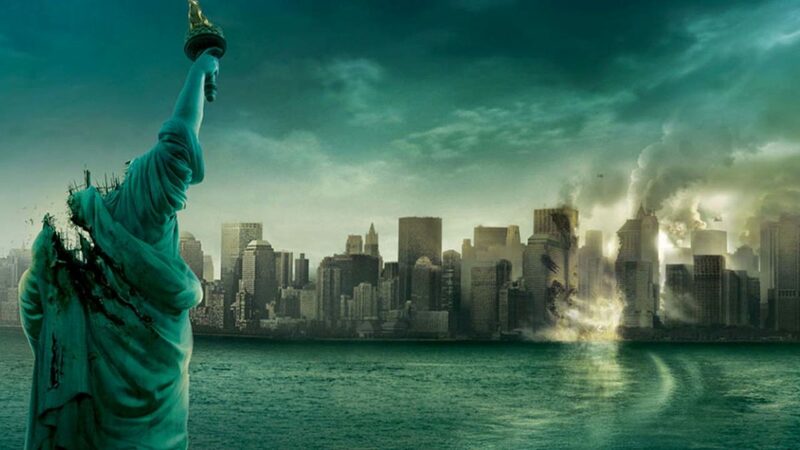 As a longtime fan of J.J. Abrams from Alias and Lost, and made a helpless sucker by the film’s clever marketing, I very much wanted to love Cloverfield. However, I found it extremely difficult to watch and to like, for two basic reasons both related to my being a New Yorker for a decade & change: I. unlikeable and unrealistic characters, and II. what can only be described as 9/11-ploitation. We know the backgrounds of only two characters, Rob and Beth. Rob has recently been promoted to Vice President of an unspecified type of company at an improbably young age, and is about to leave for a long business trip to Japan. In my understanding of lifestyles of the rich & beautiful in New York City, such young execs were more commonly found in the dot-com 90s economy, but even now still exist in scrappy new media companies like CollegeHumor.com. But let’s assume Rob helped invent the next Facebook and move on. Yowza howza! Yes, it’s true, all New Yorkers go to parties like this all the time. We don’t know what Beth, his one true love, does for a living, if anything. She lives with her family high up in the northern tower of the Time Warner Center (more on that later). Her stunning looks and wardrobe might peg her as model, but she appears to be a socialite born of privilege. But far from the slow trainwrecks that are Paris and Nicky, Beth appears to be a sweet, sober girl. In fact, she leaves a party not unconscious in the back of a limo, but out of propriety, to go home to bed, alone. Us regular joes are supposed to identify with and care about these people? For all its faults, Steven Spielberg’s War of the Worlds (another monster-attack film touching uncomfortably upon domestic disaster in a post 9/11 world) featured an everyman type character in auto repairman Tom Cruise. To be fair, Godzilla was full of white-coated scientists and teeth-gritted soldier-types, so the genre doesn’t exactly call for comparatively boring lower wage-earners that don’t live in luxury condos and party in downtown lofts. Godzilla was utterly frank in linking the monster with the horrors of the nuclear age. So if Cloverfield’s beast is a personification of terrorism, how does the metaphor fit? Did US military adventurism in Afghanistan and Iraq unearth the monster? Is the beast a heretofore undiscovered subterranean oil-feeder, angered by our draining the earth’s supply of fossil fuel? 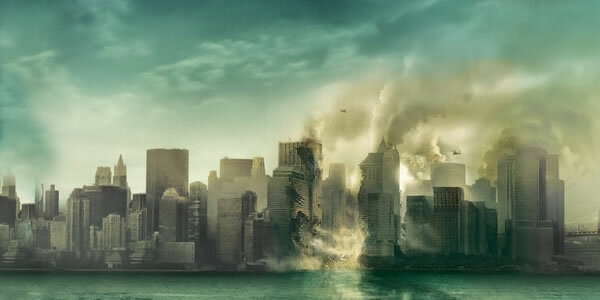 Without a clear metaphor, Cloverfield just seems to enjoy alluding to the superficial events and imagery of 9/11 without any depth: skyscrapers “pancaking” themselves flat, streets filling with clouds of debris, ash-coated survivors struck numb. I’m not against popular fiction using metaphor to touch upon raw nerves that maybe need to be tweaked now and then… but is Cloverfield it? Don’t worry, New Yorkers, it’s only a movie. One of the film’s key set pieces is set atop the twin towers of the Time Warner Center. The allusion is clear, but it’s a stretch factually. Are there residential apartments in the TW Center? As both a New Yorker and Time Warner employee, this is news to me. I should also add that the geography of Manhattan as seen in the film is just this side of realistic. In a space of about 6 hours, it’s plausible the characters could make it from lower Manhattan to the roof of the Time Warner Center at the southern foot of Central Park (assuming, that is, that their young thighs are capable of the trek). Invasion of the Bodysnatchers is one example of a sci-fi thriller that has worked well enough to illuminate concerns of the times to warrant multiple remakes. Just to name three: the original took on McCarthyism, the Abel Ferrara 90’s version looked at obedience and conformity in the military, and Robert Rodriguez’s The Faculty found the story useful as a satirical critique of high school peer pressure. But none of the various Bodysnatchers films presented us with recreations of cities pressed flat; were contemporary Japanese made sick by the sight of their horrors anthropomorphized in a giant lizard? Seeing my home city’s skyline smoking and collapsing was not something I would call cathartic. I saw the film early evening on opening day, with an audience full of kids just out of school. The movie went over like a lead balloon; the conclusion was loudly heckled and booed. I suspect the kids mostly objected to the unconventional structure and ending. Which is, for what it’s worth, what I found best about the film: it provides a very movingly unexpected happy ending.